Iniel, an Imperial commoner, is the head of the Sintav clan, one of the most respected families in the Imperial City. He lives in the Imperial City's Elven Gardens District, and has apparently found employment and houses for several of his relatives nearby. His nephew, Cyronin, has had a dispute with Talos Plaza District's resident Helvo Atius, which has caused bad blood between the Sintav and Atius clans. Iniel has a simple schedule. Every day he wakes at 6am where he goes downstairs and wanders around for six hours. At midday he leaves his house and heads over to The King and Queen Tavern to enjoy a two-hour lunch. At 2pm he returns home where he spends the rest of the day wandering around the ground floor. At midnight he enters his private quarters to sleep for six hours. On Sundas at 9am the entire Sintav clan head to Iniel's house to have a family reunion. Apart from having company in his wandering, his schedule is unchanged. The Sintav clan (except Iniel) will leave the house at 9pm where he resumes his schedule alone. The only exception to this schedule is during the Light the Dragonfires quest when Iniel, like most Imperial City citizens, is confined to his house. He wears a burgundy linen shirt and a pair of burgundy linens along with a pair of thick cowhide shoes. He also has a modest amount of gold and his key. When you meet him for the first time, he will briefly introduce himself: "I am Iniel Sintav, head of the Sintav clan." 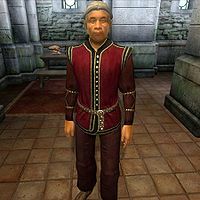 When asked about the Imperial City, Iniel will assure you that the Sintav and Atius clans lives peacefully, with one exception: "The Sintavs have always been one of the leading families in the City. We will refrain from contact with the Atius, unless provoked."